Need a great drum set played with brushes for your next track? Acousticsamples DrumTasteBrush is one on the best sample libraries of brushed drums you could ever have. During Drum Month is on sale at 30% off. 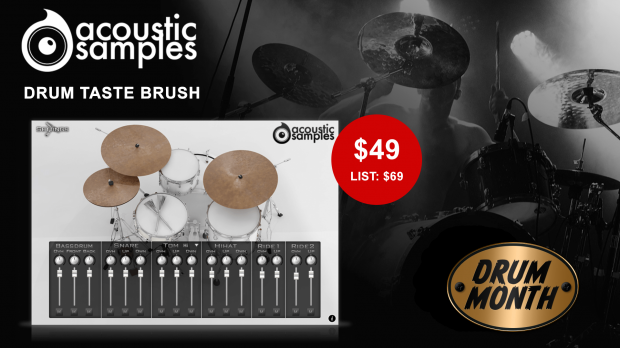 Acousticsamples DrumTasteBrush has everything you need for hyper-real drum tracks. Considerable care was taken to get the very best recordings possible so these drums will be as authentic and professional sounding as they can be. This entry was posted in DontCrack, Promotions, Virtual Instruments and tagged Acousticsamples, DrumTaste Brush, sampled drums, virtual drums. Bookmark the permalink.